We made it, my friends! Today is the 7th and last free pattern of my Seven Days of Scarfie 2017 pattern collection. And, as you may have guessed, I couldn't complete the collection without having a hat pattern! The Snowball Slouch Hat has an awesome texture texture and can be made in sizes for everyone in the family. Keep reading for the free crochet pattern. Lion Brand Scarfie yarn is available at most stores that sell yarn and also online, but if you can't get your hands on it (or can't work with yarn that has wool in it) I would recommend substituting either a heavier Category 4 worsted/aran yarn or a lighter Category 5 bulky yarn for this pattern. Definitely work up a gauge swatch to make sure you will still achieve the same size...otherwise your hat may not fit properly! If you want to read some more about the Seven Days of Scarfie 2017 collection you can read my announcement post here where you will also be able to see the other patterns I have released in this collection so far. Also, remember that through November 30th, you can purchase the ad-free pdf patterns from my 2016 Seven Days of Scarfie collection for just $7 for all seven patterns! Don't miss your chance to get these on sale if you want them! In December the pattern bundle will go back up to its usual price of $10. Lion Brand Scarfie yarn (‘Cream/Teal’ pictured) or approx. 150 yds. of a comparable yarn for the adult sized hat (including pom pom). If you substitute yarn be sure to check the gauge. Row 1: SC in the second ch from the hook and SC across (8). Turn. Row 2-40: ch 1, SC in the BLO across (8). Turn. When you finish the ribbed band, fold it so that Row 1 and 40 are on top of on another. Working through the back loop of Row 40 and the front loop of Row 1, seam the two rows together by slip stitching across. Do not cut your yarn. Continue on to work in rounds along the “raw” edge of ribbed band. Round 1: ch 1, SC around the top of the band working one stitch per row (40). Attach to first SC of the round with a sl st. Round 2: ch 1, work a SC and DC into the first st, skip 1, *(SC, DC) into the next st, skip 1, repeat from * around (20 sets of SC/DC), join with a sl st to the first SC of the round. This stitch is called the ‘Grit Stitch’. Round 3-8: ch 1, *(SC, DC) into each SC st from the previous round (20 sets of SC/DC), join with a sl st to the first SC of the round. Round 9: ch 1, *SC2Tog, DC2Tog, repeat from * around (20). Join to the first st of the round with a sl st. Round 10: ch 1, *SC2Tog, DC2Tog, repeat from * around (10). Join to the first st of the round with a sl st. Tie off leaving a long (approx. 12”) tail of yarn. Using a yarn needle, weave the yarn back and forth through the stitches of Round 10. Pull tight to cinch the top of the hat closed. Make and attach a pom pom if desired. Weave in all ends. Row 2-42: ch 1, SC in the BLO across (8). Turn. When you finish the ribbed band, fold it so that Row 1 and 42 are on top of on another. Working through the back loop of Row 42 and the front loop of Row 1, seam the two rows together by slip stitching across. Do not cut your yarn. Continue on to work in rounds along the “raw” edge of ribbed band. Round 1: ch 1, SC around the top of the band working one stitch per row (42). Attach to first SC of the round with a sl st. Round 2: ch 1, work a SC and DC into the first st, skip 1, *(SC, DC) into the next st, skip 1, repeat from * around (21 sets of SC/DC), join with a sl st to the first SC of the round. This stitch is called the ‘Grit Stitch’. Round 3-11: ch 1, *(SC, DC) into each SC st from the previous round (21 sets of SC/DC), join with a sl st to the first SC of the round. Round 12: ch 1, *SC2Tog, DC2Tog, repeat from * around (21). Join to the first st of the round with a sl st. Round 13: ch 1, *SC, DC2Tog, repeat from * around (14). Join to the first st of the round with a sl st. Tie off leaving a long (approx. 12”) tail of yarn. Using a yarn needle, weave the yarn back and forth through the stitches of Round 13. Pull tight to cinch the top of the hat closed. Make and attach a pom pom if desired. Weave in all ends. Row 1: SC in the second ch from the hook and SC across (10). Turn. Row 2-44: ch 1, SC in the BLO across (10). Turn. When you finish the ribbed band, fold it so that Row 1 and 44 are on top of on another. Working through the back loop of Row 44 and the front loop of Row 1, seam the two rows together by slip stitching across. Do not cut your yarn. Continue on to work in rounds along the “raw” edge of ribbed band. Round 1: ch 1, SC around the top of the band working one stitch per row (44). Attach to first SC of the round with a sl st. Round 2: ch 1, work a SC and DC into the first st, skip 1, *(SC, DC) into the next st, skip 1, repeat from * around (22 sets of SC/DC), join with a sl st to the first SC of the round. This stitch is called the ‘Grit Stitch’. Round 3-14: ch 1, *(SC, DC) into each SC st from the previous round (22 sets of SC/DC), join with a sl st to the first SC of the round. Round 15: ch 1, *SC2Tog, DC2Tog, repeat from * around (22). Join to the first st of the round with a sl st. Round 16: ch 1, *SC2Tog, DC2Tog, repeat from * around (11). Join to the first st of the round with a sl st. Tie off leaving a long (approx. 12”) tail of yarn. Using a yarn needle, weave the yarn back and forth through the stitches of Round 16. Pull tight to cinch the top of the hat closed. Make and attach a pom pom if desired. Weave in all ends. Row 2-48: ch 1, SC in the BLO across (10). Turn. When you finish the ribbed band, fold it so that Row 1 and 48 are on top of on another. Working through the back loop of Row 48 and the front loop of Row 1, seam the two rows together by slip stitching across. Do not cut your yarn. Continue on to work in rounds along the “raw” edge of ribbed band. Round 1: ch 1, SC around the top of the band working one stitch per row (48). Attach to first SC of the round with a sl st. Round 2: ch 1, work a SC and DC into the first st, skip 1, *(SC, DC) into the next st, skip 1, repeat from * around (24 sets of SC/DC), join with a sl st to the first SC of the round. This stitch is called the ‘Grit Stitch’. Round 3-17: ch 1, *(SC, DC) into each SC st from the previous round (24 sets of SC/DC), join with a sl st to the first SC of the round. Round 18: ch 1, *SC2Tog, DC2Tog, repeat from * around (24). Join to the first st of the round with a sl st. Round 19: ch 1, *SC2Tog, DC2Tog, repeat from * around (12). Join to the first st of the round with a sl st.
Love matching sets? 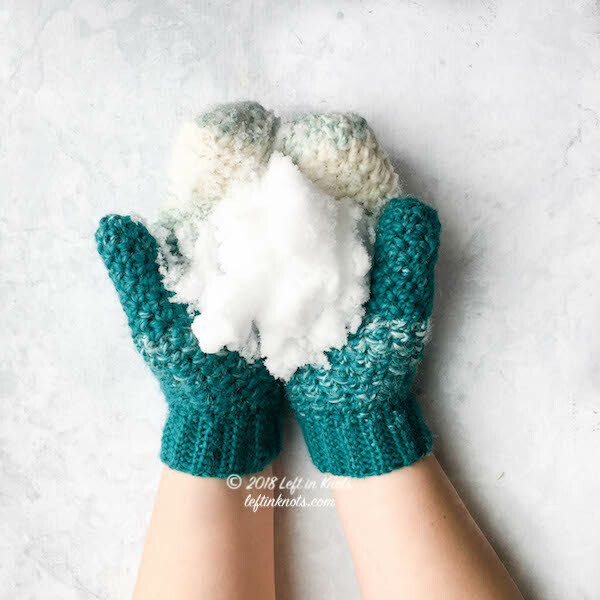 Remember to make a pair of the matching Snowball Mittens - another free pattern available here.